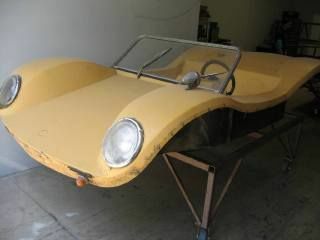 The body and hood are two seperate fiberglass parts bolted together. The dash may or may not be bonded to the hood. 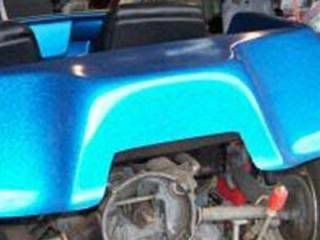 Some of the earliest body kits and designs were built from steel or wood instead of fiberglass. 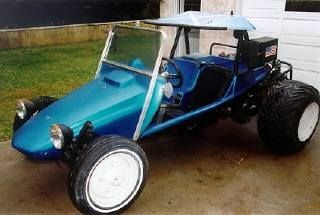 This style of dune buggy has a molded hood, dash, and body all formed as one complete part. 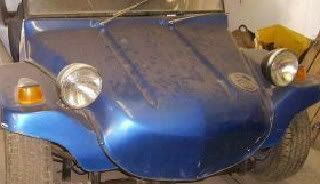 Nothing seperates the hood from the fenders. 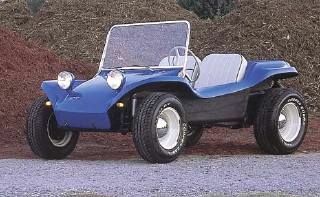 These buggies were nornally cheaper to produce because the molds were less complicated. 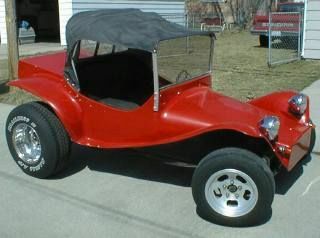 T-Buggies resemble the front of an old Model T Ford. 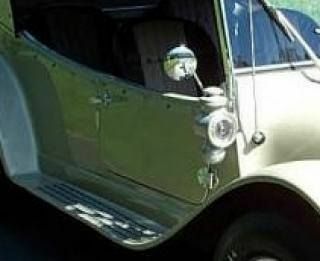 They often have running boards. 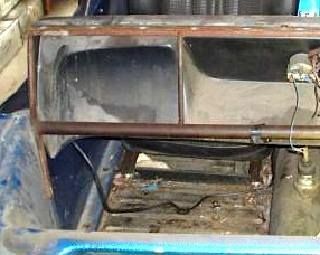 The seats and peddles may be moved from the stock Beetle location. 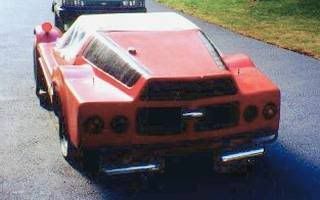 The Towd body style resembles the original Meyers Towd design having no covering over the engine and a very minimal hood. 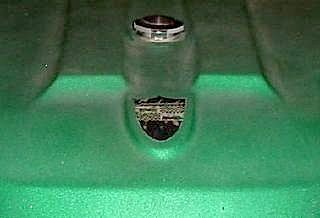 A light weight molded plastic with an immitation style leather finish and always molded in black. 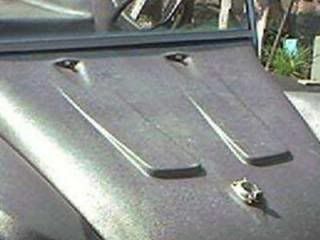 The dash was molded as a separate piece and joined to the hood. There is a seam under the windshield. 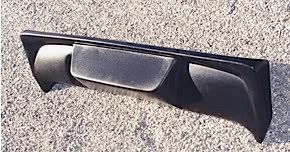 If you look behind the dash, it may have a steel frame behind it that supports the dash and windshield. 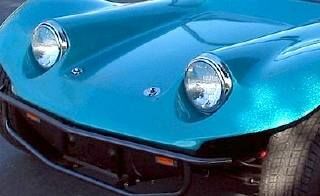 These fenders look like a claim shell pointing up - its rounded with a sharp ridge running along the top - Corvette style. 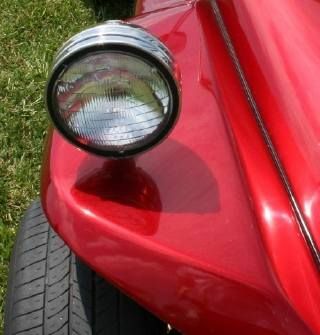 If you can set a beverage on the fender and not worry about it falling off, the fenders are flat. 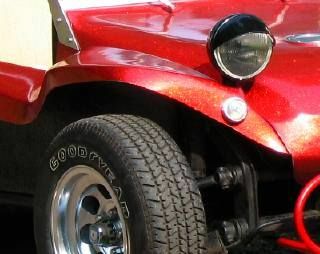 The buggy does not have fenders - leaving the front wheels fully exposed. 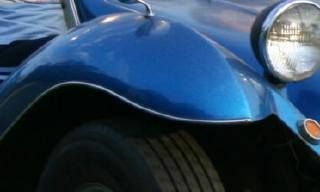 The front fender is round, but not to be confused with a clam shell fender which is also round but has a ridge on the top. 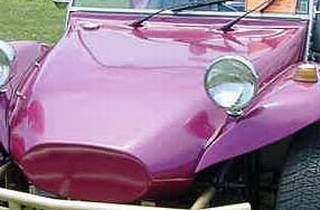 The fender slopes down low into running boards along the side of the buggy. Similar to flat with sharp angles, but there is no surface parallel with the ground. 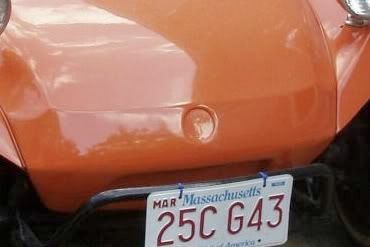 A hood with a bump for an emblem. These come in many different shapes. 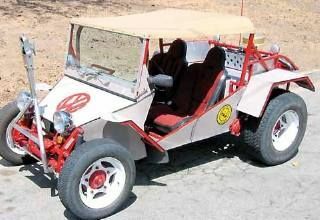 They are typically the small logo places that were molded into a dune buggy hood for the maker to place a small sticker or badge on. 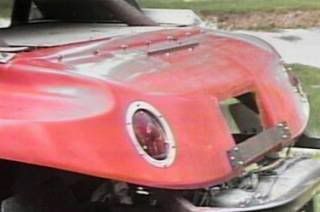 A hood with buckets molded in for built-in headlights. 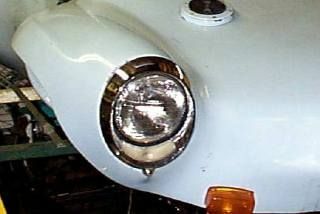 If the buckets are over the wheels and not in the hood, they you have "Headlight Buckets Fender" instead. 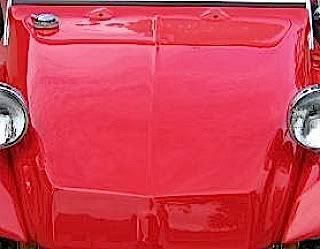 A Model T hood resembles the hoods of an old Model T Ford. It typically is shaped like a radiator. 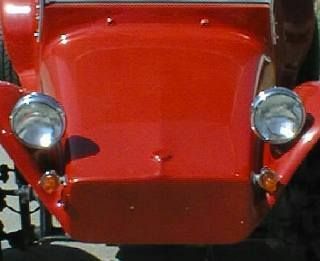 A hood with a recess for a manufacturer's emblem. 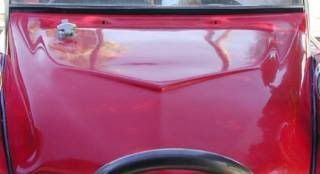 This hood has one or more raised ridges that run from the front of the hood to the windshield. It may vary in width from a sharp edge up to a couple inches in width. A scalloped hood has a recessed portion running from front to back - the opposite of a ridge. 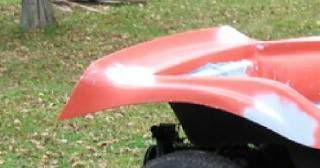 This hood has one or more wide raised (or recessed) areas not the full length of the hood. 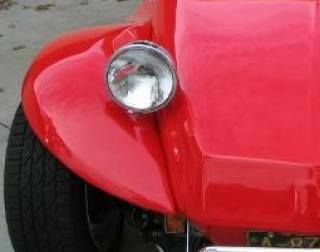 This hood is smooth on top - no ridges, scoops, bumps, headlight buckets or recesses. A box tail is characterized by a simple box on the back that could be rectangular or trapziodal in shape in the middle of the tail. 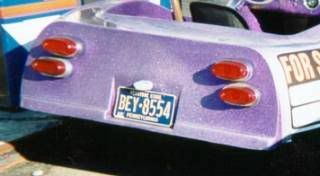 The tail has molded in areas to hold specific tail lights. Not only is there a box out the back to cover the engine, but another box extends out of the first box - yes, a double box. The rear is basically flat, sloping downward at an angle. No box over the engine. Has a small spoiler on the top edge. 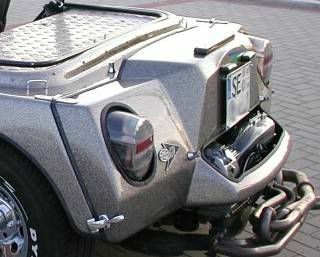 An enclosed tail resembling a modern hatch back. The tail section opens upward for storage. 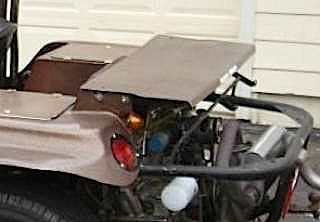 A flip up lid over the engine area. There really is no tail leaving the engine hanging out in the open. 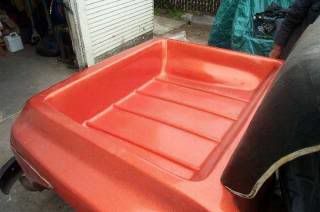 A rear storage area resembling a pick-up truck. 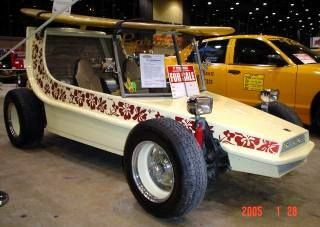 Possibly with a tail gate. 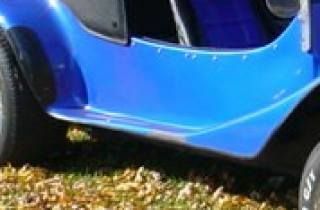 The fenders peak up into a pair of ridges on eitther side of the tail. The tail swoops back to a section the size of a US where its then squared off. 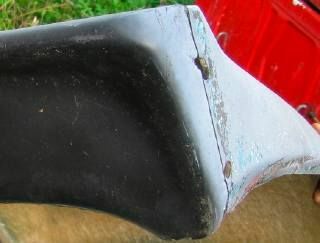 A large wing molded into the tail.